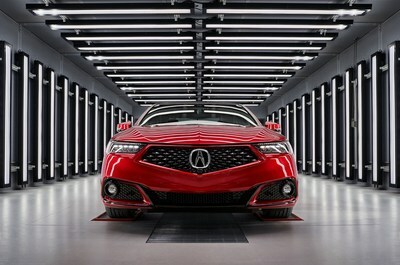 NEW YORK, April 11, 2019 /PRNewswire/ -- Harnessing the unique capabilities of its bespoke Performance Manufacturing Center (PMC) in Marysville, Ohio, Acura will introduce handcrafted limited-edition vehicles, starting with the 2020 TLX PMC Edition. With production starting this summer, the 2020 TLX PMC Edition will be built by the same master technicians that hand assemble the Acura NSX supercar. Deliveries of the exclusive 2020 TLX PMC Edition will begin this summer with pricing around $50,000. An MDX PMC Edition will follow. Both the production TLX PMC Edition and MDX PMC Edition Prototype make their world debut at the 2019 New York International Auto Show and will be on display throughout public show days, April 19-28, at the Jacob Javits Center.